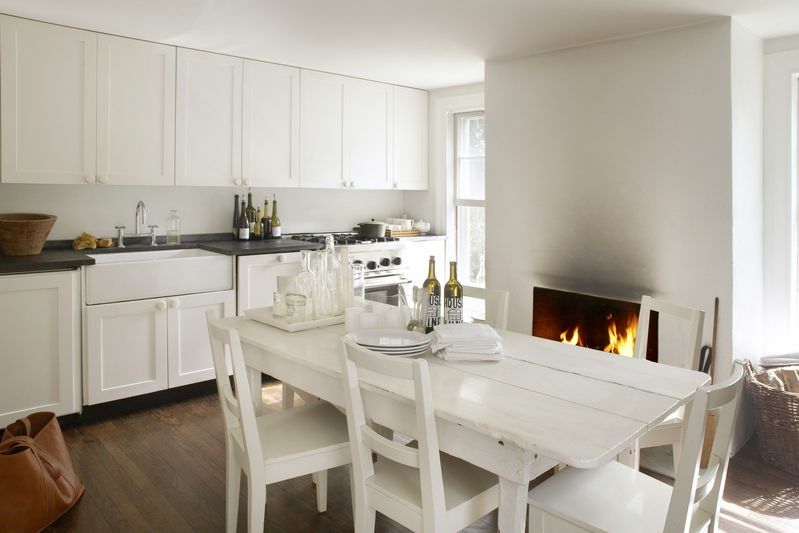 Interior designer Tricia Foley, whose upcoming title Life | Style chronicles her loving renovation of an all-white Long Island home, shares her tips for picking out and using white paint. Whether your home is modern or traditional, in the country or in the city, a white paint palette provides the perfect backdrop for any style. The interiors I create are done in many shades of white: There are warm, cozy whites in shades of cream and ivory, cool whites with a touch of blue for a clean, minimal look, and chalky whites with a hint of grey for historic interiors. When shopping for white paints, I love looking at the names on paint charts and envisioning how they could be used in a space together, to evoke different moods as one transitions between rooms. In the kitchen I want a clean, fresh white; in the dining room, a soft white backdrop for my china; in the living room, a warm old-fashioned white for the bookshelves; and in my bedroom, a calming white. Painting the window trim white inside and out brings reflected light into a room, brighting the space. 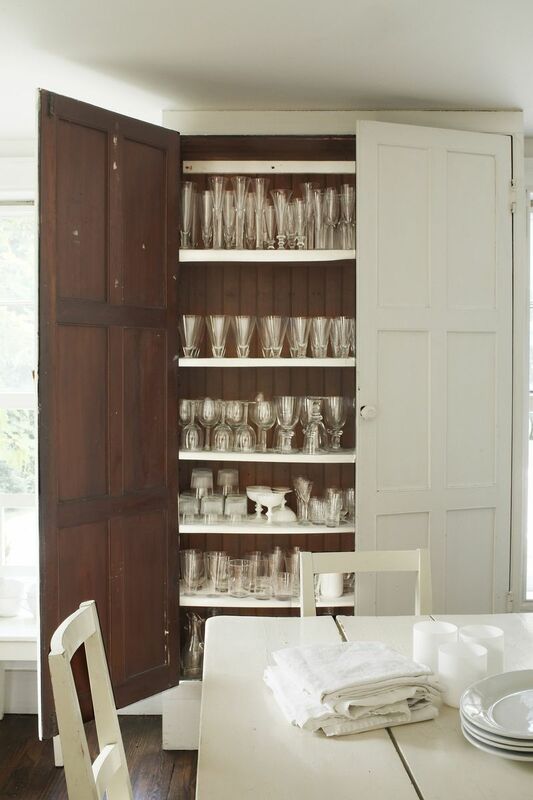 A good way to keep closets and cabinets brighter inside is to paint them a clean white. To give the illusion of more height, ceilings are often painted a flat white, sometimes with a tint of color from the wall paint. 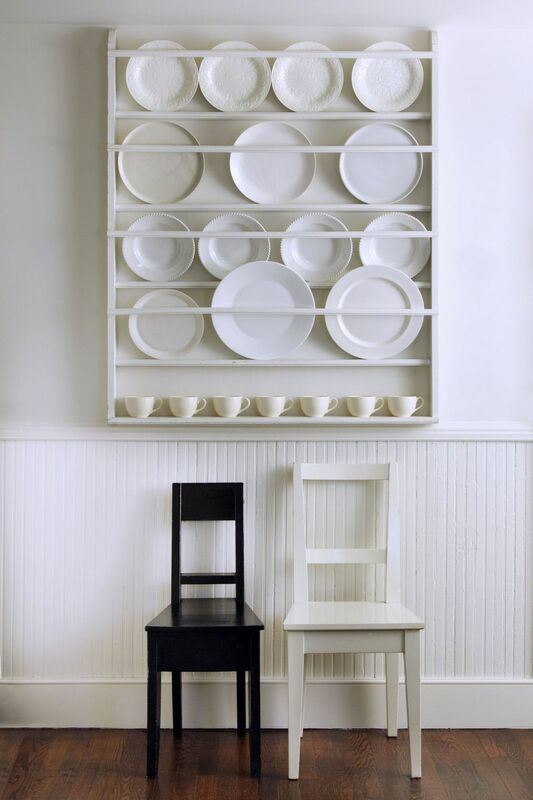 A collection of disparate chairs or tables come together painted the same white, whether it’s in a romantic old summer house or a minimal Scandinavian inspired space. I like the simplicity of white, the cleanliness of white, the purity of it, the blank slate of it, and the world of possibility in it. It represents serenity and calm to me—and a fresh coat of white paint makes everything new again. Ralph Lauren’s Brilliant White, Benjamin Moore’s Super White, and Farrow & Ball’s All White are some of my favorites—but these are some other reliable white paints, grouped by type. What white paints do you love? Let me know in the comments! Photographs in post by Marili Forastieri; home page photograph by William Abranowicz. Designer Tricia Foley, whose upcoming title Life | Style chronicles her loving renovation of an all-white Long Island home, shares her tips for picking out and using white paint. many years ago, and I still love it! I did read your article on whites, but which color did you use in the kitchen picture? (How to choose the right white paint) I love the feel! Thank you. Benjamin Moore Cloud White. An old color that may not be their main deck any more, but can be mixed to match by Benjamin Moore and most other paint companies. I use it in eggshell for the trim in every room. I just finished painting my living room in the Pacific Northwest BM's Simply White in Eggshell with Super White in Semi Gloss for the ceiling and trim. It has made the room's traditional architecture feel modern but still warm and inviting. I works well with the wood floors as well. In the master bedroom I painted the walls BM's Mountain Peak white. It has a lovely warm glow without reading yellow. Unfortunately, I used Decorator's White as trim color which reads to gray next to the wall color so I will be repainting that with Super White as well. We used BM's China White on our ceilings and LOVE IT! Here in Australia, a fave is Dulux 'Antique White USA' or 'Chalk White USA'. I really like the look of corn forth white you showed. Benjamin Moore's Swiss Coffee - a delicious, soft white -- is also gorgeous, especially when paired with certain other neutrals. https://www.google.com/search?q=benjamin+swiss+coffee&espv=2&biw=866&bih=958&tbm=isch&imgil=eK48KfWmiPA40M%253A%253Bvh5B8A4h98MHDM%253Bhttps%25253A%25252F%25252Froomlust.wordpress.com%25252F2014%25252F12%25252F18%25252Fbenjamin-moore-swiss-coffee%25252F&source=iu&pf=m&fir=eK48KfWmiPA40M%253A%252Cvh5B8A4h98MHDM%252C_&usg=__J4bTwdJWsgmh4uAiPqZR2B_wg94%3D&ved=0CDEQyjdqFQoTCOehuruox8cCFZVaiAodSDIHfQ&ei=HP3dVeejKJW1oQTI5JzoBw#imgdii=LiryyA02nVNNhM%3A%3BLiryyA02nVNNhM%3A%3B7aMN7CWMVTKR8M%3A&imgrc=LiryyA02nVNNhM%3A&usg=__J4bTwdJWsgmh4uAiPqZR2B_wg94%3D Other than that, which is on our cabinets and most of the wood trim (excluding the crown molding) in kitchen. Elsewhere in our house, we use Benjamin Moore's China White and White Dove almost exclusively (where we use white). I used to be a Kelly-Moore Swiss Coffee guy, but I switched to Kelly-Moore Antique White. Flat finish most places, eggshell finish in a few others. No more semi-gloss/glossy for me. Lots of great white shades these days. I've painted all my bedrooms for the past 10 years with Ralph Lauren Egret. It's impossible to identify the underlying tones of the color. I love it so much!